Sports viewing parties are loud and exciting events. The crowd is divided into the two teams they’re rooting for and there is no shortage of cheers as well as jeers. Depending on the magnitude of the event, like the FIFA World Cup finals, NBA Finals or a tennis match between Roger Federer and Rafael Nadal, restaurants and bars easily get packed with people and become mini stadiums during such parties. Football, either the American (rugby) or European (soccer) versions draw the largest crowds in any sporting event in the world. 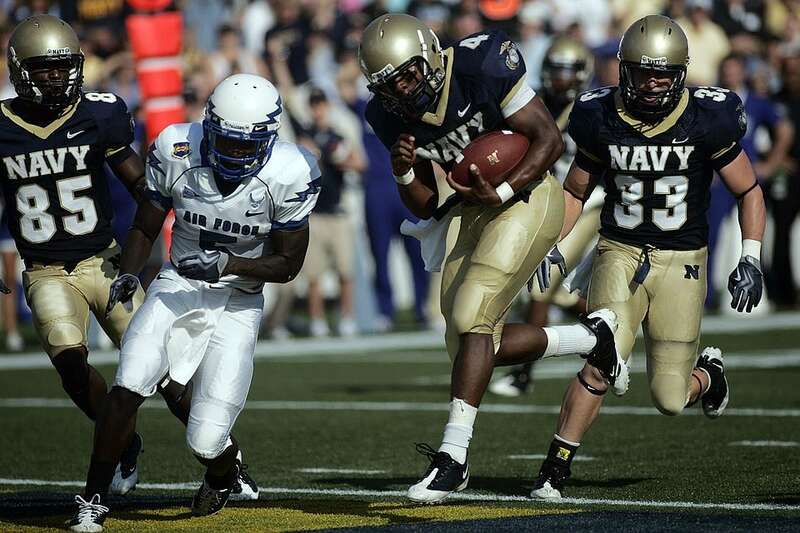 The National Football League (NFL), the USA’s premiere football league averages around 20 million viewers every week in a span of three months while the most popular soccer league in the world, the English Premier League, which runs around eight months, attracts an average of 500,000 viewers per week. No other sport comes close except for basketball (NBA) and mixed martial arts (UFC). This doesn’t take into account the FIFA World Cup, the oldest and most popular soccer competition in the world which is held every four years. No matter what version of football people are watching, make sure to have an appetizing menu to please them during and after the game. 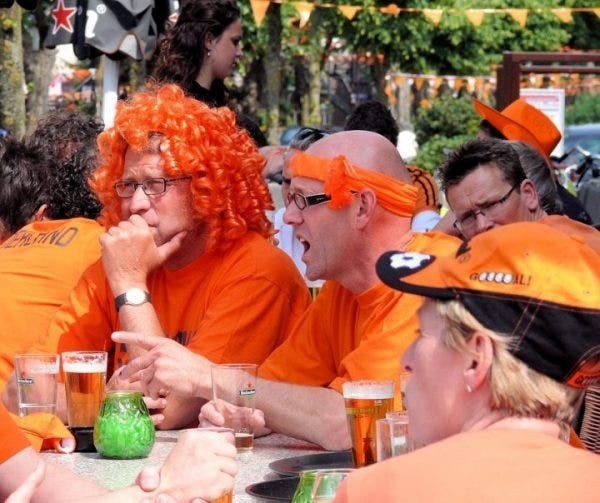 Football viewing parties are no-holds-barred events as fans of either American or European football can be very passionate about their favorite sport. 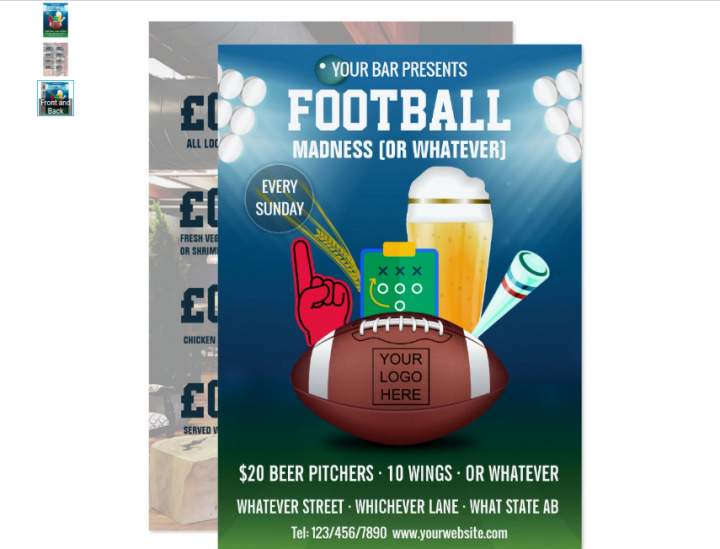 So if you’re planning your own sports viewing party, here are some football menu templates to use in your bar or restaurant. Try checking out these other football menus as well. 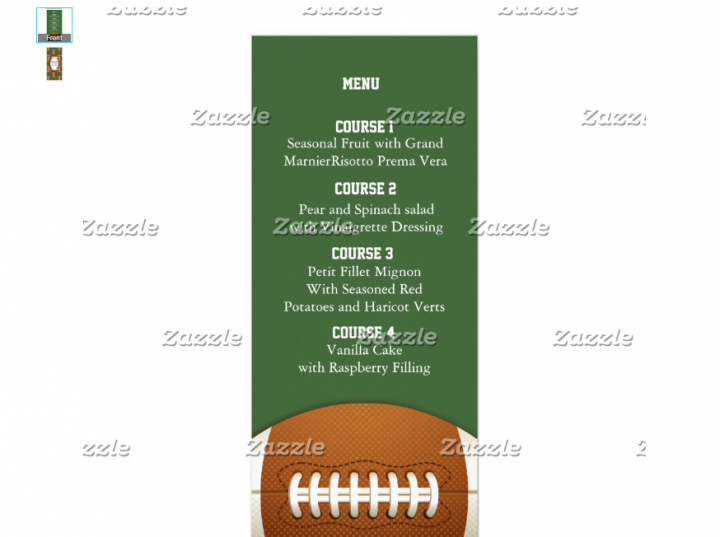 This football menu template contains more or less the basic elements associated with being a football fan. You have the football itself, foam hand, trumpet, coach’s playboard, and beer. 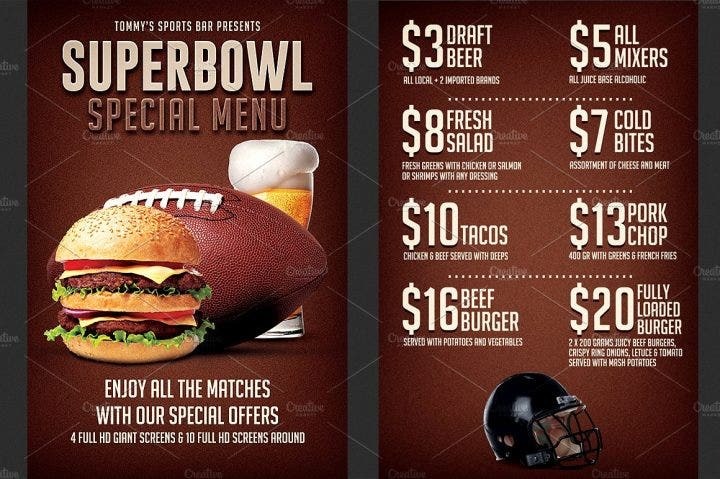 Combining all these football-centric equipment together in a single menu design can thrill any football fan. You can list down what food to serve in the text area of the lower part in the menu as well RSVP information for the viewing party. 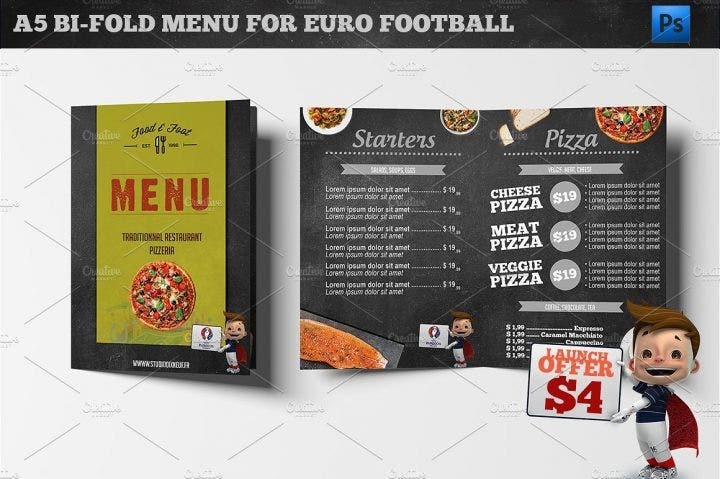 This is more or less the same menu template but instead of a template made for a football fan, it looks like its made for the sports fan in general who loves all kinds of sports. The foam hand, trumpet, and coach’s playboard are replaced with a basketball, tennis racket, baseball, and a racing flag. The beer is still there, as well as a wooden signboard. The signboard looks out of place and really doesn’t have a connection with the sports equipment, but it works. The color of the signboard matches the color of the images and complements the design background. 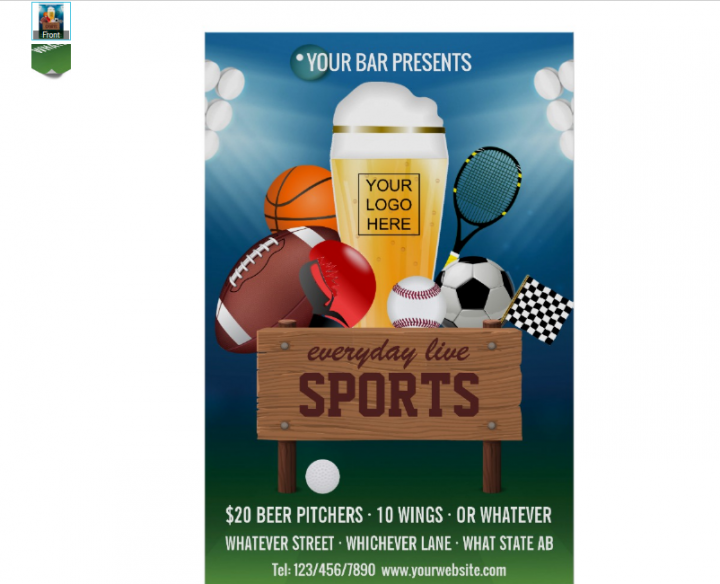 Use this menu template for any sporting event and make your bar the go-to sports bar in your city. This pitch, otherwise known as the field, is where all the action takes place. Use the pitch as the main attraction of your menu template and make your customers feel like they’re playing the actual game. Although it has more of a kids’ cartoon design, it still fits the viewing parties for rofessional league games and tournaments. The pitch is the center of everything that transpires within the game, so why not make this your ideal viewing party menu template? What is the best combination when watching sports events? A hamburger and a glass of beer. A case can also be made for barbecue or steak with beer. 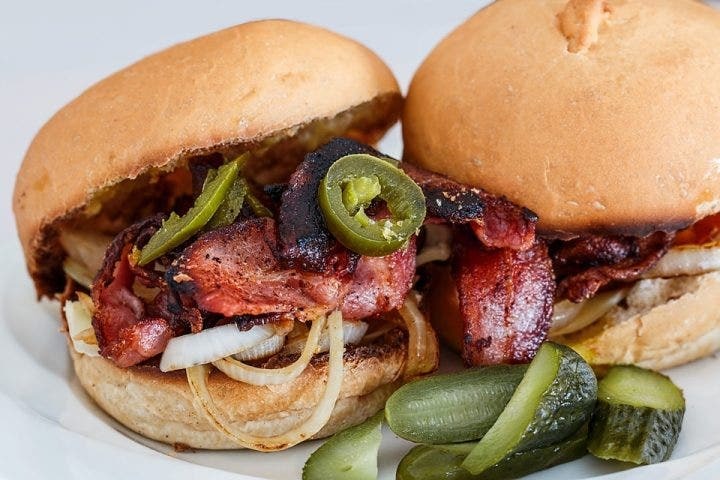 Take a bite of that mouthwatering burger every time your team scores and chug it down with icy cold beer. This menu template brings out the appetite in your customers as the the burger and beer are edited beautifully to show their perfect forms. The juiciness of the burger and its tasty contents can be seen as well as the beer bubbles. Pair those two with a football and you’re all set for the game. This soccer ball menu template has the most common yet exciting design which uses the soccer ball itself. Also called “the beautiful game” due to legends like Pele, Diego Maradona, and Lionel Messi having beautiful control and skill with the ball, it is only fitting to use the soccer ball as the central design. 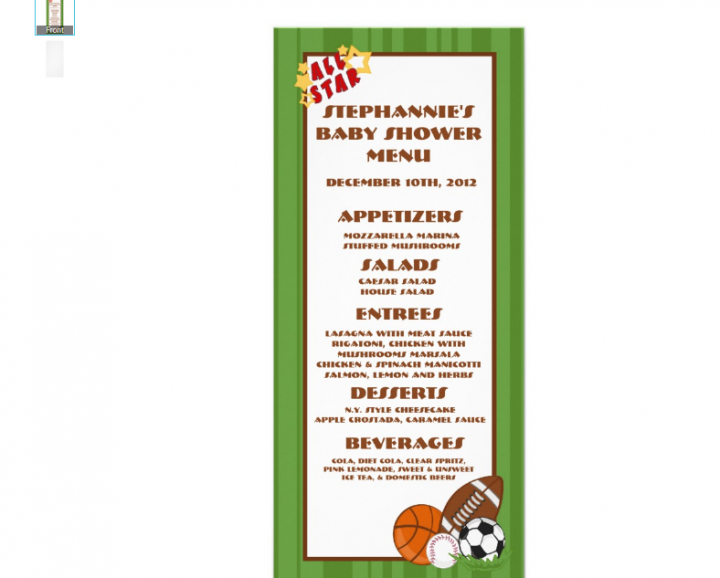 The menu is written at the center of the template and doesn’t interfere with the ball’s design, making the customer focus on the food rather on the menu template. If you think basketball and baseball are America’s most popular sports, think again. Both are dwarfed only by American football. 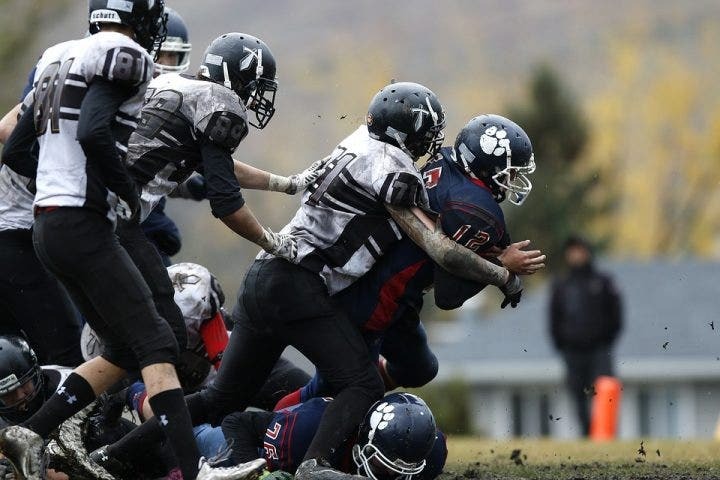 If kids and adults can be seen playing football in beaches, parks, and schools around Europe and South America, then the same can be said for American football in the USA. Families and friends play together anywhere as the game doesn’t require a net or a hoop, and just like soccer, all you need is a marker where you need to go to score. 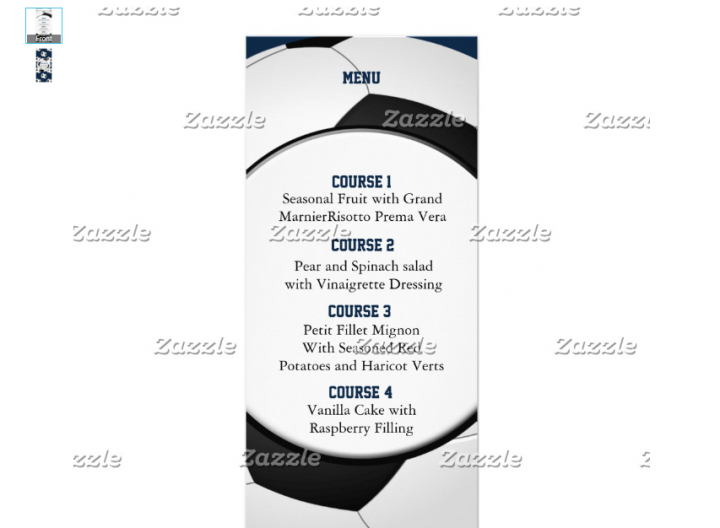 This menu template shows an image of a zoomed in football where the food prices are listed in the middle of the template. A simple green color represents the backdrop of the template. This highly detailed bi-fold menu template is best used if you sell a lot of dishes in your restaurant. Additionally, a placeholder located at the cover page of the template will let you add what event you are hosting or offering a viewing party for. 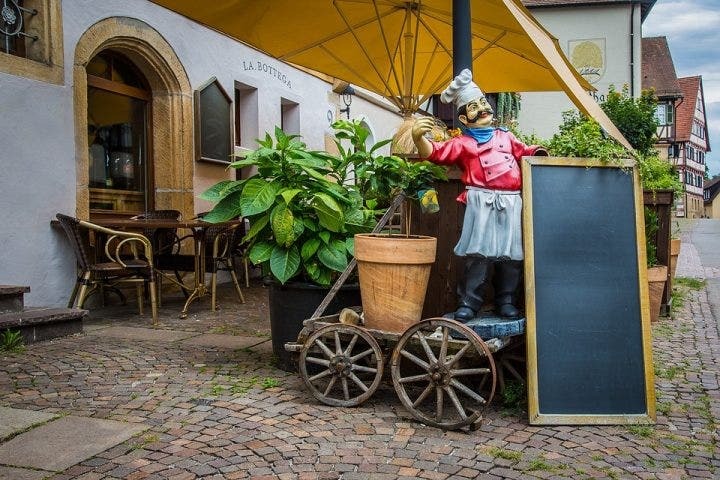 This helps your restaurant advertise the event as well as promote your own restaurant. The fonts used are clear and readable and also has the option to make icons for prices. 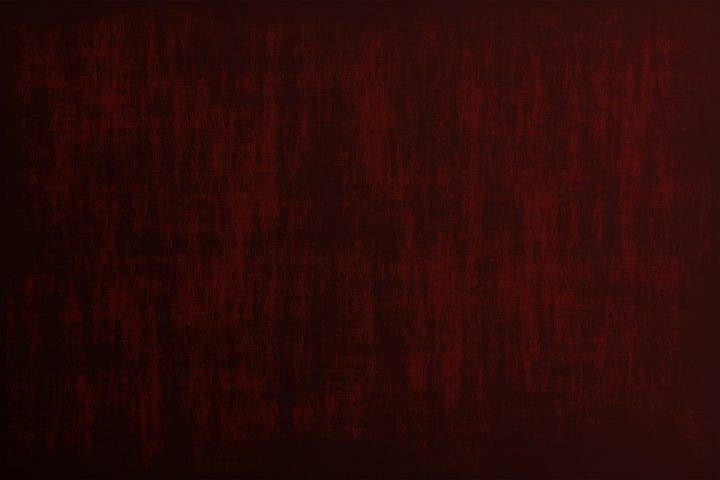 You can also add images in this template. Make your menu designs bold and aggressive. Sports are never for the faint of heart. They are often played with skill and finesse, but the team that has more aggression often wins the game. This aggressive approach should also be applied to your football viewing party menus. Football viewing parties are never formal events where everyone needs to follow decorum. 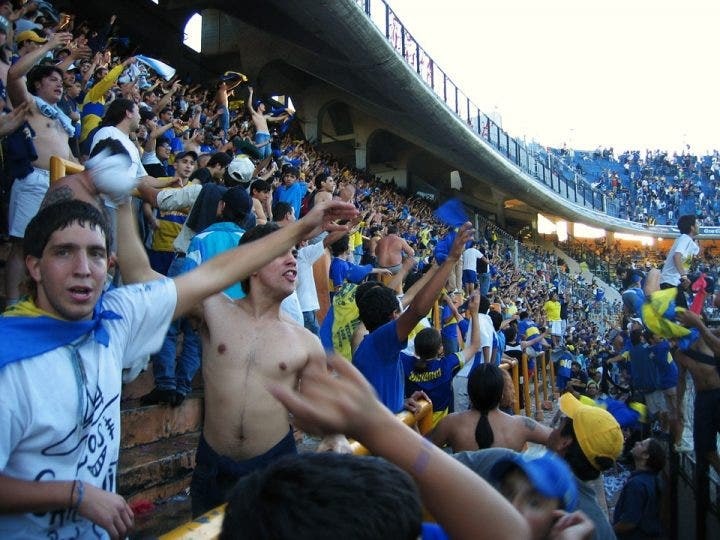 Just like the game itself, football is rough and the game gets heated between the players and fans all the time. Use some designs, images, and colors that lean on aggression like darker colors such as red or violet. Remove unnecessary text. There is no need to give details on your dishes (the ingredients that were used, how the food was cooked, etc.) when making this type of menu. Additionally, the name of the dish and its corresponding price are all you need when making a football viewing party menu. Reserve the fancy words for the fancy restaurants. Add images of your food. As mentioned earlier, customers don’t want to waste their time on the menu and focus on the game instead. Add large and clear images of the dishes you intend to serve so that customers can just point to the images whenever they order. When customers arrive in droves, menus should be passed around in quick succession. A menu which stalls in a customer or a group will cause some problems with the next batch of customers who want to something to eat when watching the game. 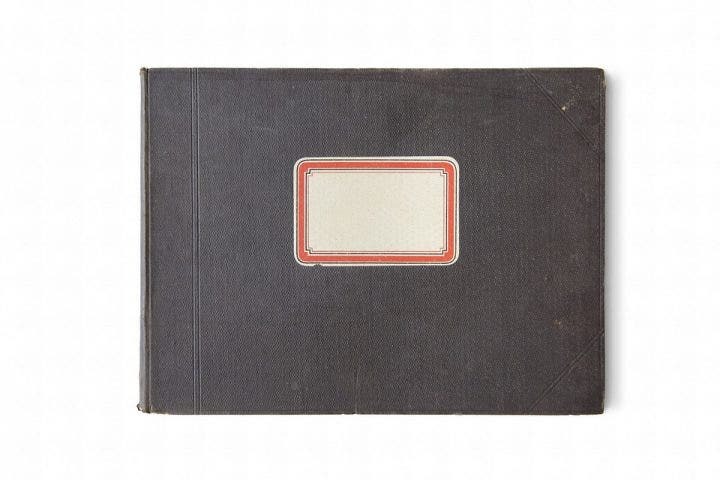 Get some sturdy menu covers. It’s not a good experience especially for servers if customers accidentally knock over their glasses and its contents pour over the menus. It’s an occurrence that certainly happens during football viewing parties as the game gets intense and one team scores at the last minute. It may be a moment of celebration for fans, but it’s a moment of disappointment for the restaurant. You might have to print another copy as the menu gets too wet and unreadable. Use some wooden finishes with water resistant fabrics in the menu, or if you have the budget for it, get some aluminum, brass, or copper finishes. Use some dark colors. As previously cited, darker colors fit football viewing parties better. The pink and yellows should be reserved for more lighthearted events like bridal showers and weddings. Pair some dark colors together to match the aggressive design of your menu. As the match pits two teams together with a trophy and legacy on the line, and fans watching the game look as tough as the athletes competing in the real game, you definitely don’t want to fill your menu with multiple shades of pastels. You also don’t want to use bold red text with a black background for baby shower invitations. Each occasion calls for appropriate designs and colors, so be sure to pick the right combination for your sports viewing parties.